The river's water for decades was considered so dirty that it was dangerous to consume, but that was before years of cleanup efforts. No matter how much cleaner it gets, from Fenway Park to Boston Garden and far beyond, the Charles River will always be acclaimed for its "Dirty Water" that the proto-grunge band The Standells sang about all the way back in 1966. 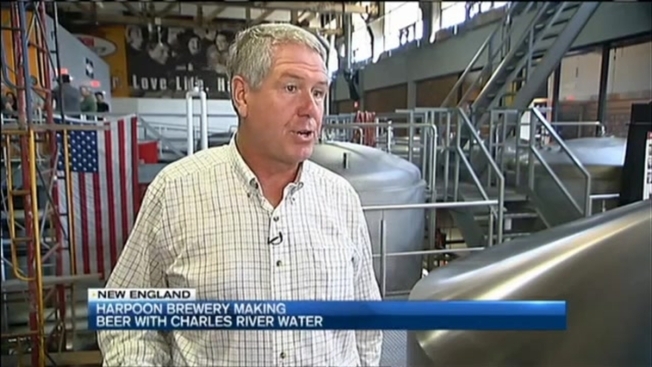 But in a major real-world milestone for how much cleaner sewer repairs and pollution controls have made the Charles, that onetime dirty water is now the prime ingredient in Harpoon Brewery's upcoming "Charles River Pale Ale." It's a limited-edition batch of beer made from 400 gallons of water that Harpoon had a Newton water-purification company, Desalitech, pull from the river, filter and treat. "While the Charles River has pretty clean water, it's still not pure enough for us to use directly as a brewing ingredient," Harpoon president Charlie Storey said in an interview Wednesday afternoon. But after being filtered twice by Desalitech's high-tech system, "that water met the highest standards of water purity and enabled us to go ahead and brew this beer." Storey anticipates the total yield will be about 20 kegs of beer, which Harpoon will offer at its Boston beer hall next to its brewery on the South Boston waterfront and at the Hubfest celebration in late October. The unending appeal of the Standells tune aside, the reality is the Charles River is now the cleanest it’s been in decades, according to the most recent annual analysis of tests made by the Charles River Watershed Association. You generally can't drink the water raw, but you can safely swim in the Charles on average 7 out of every 10 days, according to CRWA's latest annual "report card" for the river. Some people we talked to near the Anderson Bridge over the Charles near Harvard Square remained skeptical, however, about the idea of the Charles as a beer ingredient. "That's pretty interesting, to say the least," said Michael Subenko of Weymouth. "Who's going to be the first in line to drink it?" Others, though, say "go for the gusto." "I'd drink anything – at least once," said Ed Agni of Scituate. "As long as they filter it. And, listen, there's oysters in there cleaning it up." For his part, Storey is promising that "the beer will be very enjoyable. It's certainly got a great story behind it."